The obituary in the Courant reports: Allen ... was a pioneer in the retail milk business. He started house-to-house delivery of milk from his farm on East Weatogue Street more than 60 years ago. He still owned and managed the farm at the time of his death. Holcombe was the oldest member of First Church of Christ Congregational and is believed to have been the oldest resident of Simsbury. He served as deacon of the church for more than 50 years and also served as clerk and treasurer for many years. He represented Simsbury in the State Legislature in 1931 and 1932. Allen and Clara were enumerated in the 1900 Simsbury, Hartford Co., CT, federal census, page 8A. His birth was listed as Nov 1860 and age as 39. Clara was 35. Howard and Esther were in the household, as was Allen's mother Sarah and his brother Wilbur. Allen J. and Clara D. were enumerated in the 1920 Simsbury, Hartford Co., CT, federal census. He was a farmer, age 60, she was 56. Others in the household were mother-in-law Helen Deming 80, brother Wilbur Holcomb 71, son-in-law Walter Smith 30, and daughter Esther Smith 29. Allen and Clara were again enumerated in the Simsbury federal census, district 209 in 1930. He was 70, she was 66. Daughter Smith and her children were also in the household. They were again enmerated in Simsbury in 1940 with daughter Patricia Smith, son-in-law Walter P. Smith and grandchildren Thomas H. 18 and Patricia 15. At the time of his death, Allen was reported to have one daughter and one son, three grandchildren, and seven great-grandchildren. [S642] Jean E. Perreault, Simsbury 1930 Census, page 178. [S344] Joyce A. Cahill Simsbury Cemetery, Page 200. [S344] Joyce A. Cahill Simsbury Cemetery, Page 201. Howard and Josephine were enumerated in the 1930 Waterbury, New Haven Co., CT, federal census. He was 44, she was 43. The only child in the household was Lois F., 7 years 5 months. Howard registered for the WWII draft while living at 173 Chipman St., Waterbury, New Haven Co., CT, and worked at the Waterbury Farrell Foundry & Machine Co. He listed Josephine as his closest relative. [S137] Elisha Scott Loomis, Joseph Loomis, Page 452, Item 5441. Alfred E. Holcombe was born on 22 June 1864 at Windsor, Hartford Co., CT. He was the son of Pliny Holcombe and Julia Loomis. Alfred E. Holcombe married Grace W. Gray, daughter of Samuel W. Gray and Sarah (? ), circa 1893.1 Alfred E. Holcombe died in August 1954 at home, Windsor, Hartford Co., CT, at age 90. 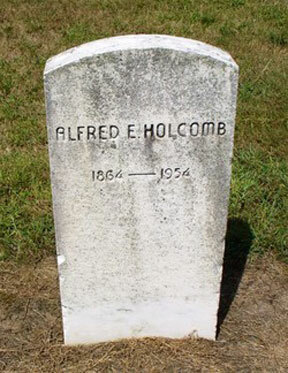 He was buried in August 1954 at Elm Grove Cemetery, Windsor, Hartford Co., CT.
Alfred's obituary in the Hartford Times: Mr. Holcomb was one of the oldest residents of Windsor. He was employed for 26 years as a carpenter by the Dunham Hosiery Company in the Poquonock section of Windsor. After the mill closed in 1910 he was hired by three Windsor men to clear several large pieces of land which now form a good part of the plantations of the Hartman Tobacco Company. He was born in a house across from the Elm Grove Cemetery in the Poquonock district where he is to be buried Friday. A few weeks ago Mr. Holcomb, chatting with a friend said he could recall the arrival of the first trolley car, the first automobile and the first electric lights in Windsor. He was a member of the Fire Department in the days when it depended on a bucket brigade to get water to a fire. He played the cymbals in the Poquonock Fife and Drum Corps. He was a member of Palisado Lodge, IOOF, and of the Modern Woodmen of America. Alfred E. and Grace W. were enumerated in the 1920 Windsor, Hartford Co., CT, federal census, ED 201, page 11A. He was a carpenter age 55, she was 46. There were no children in the household. Grace's widowed mother, Sarah age 72 was living with them. Alfred and Grace were enumerated in the 1940 Windsor federal census. He was 75, a public school janitor, she was 67. Grace W. Gray was born in August 1873 at CT.1 She was the daughter of Samuel W. Gray and Sarah (? )2 Grace W. Gray married Alfred E. Holcombe, son of Pliny Holcombe and Julia Loomis, circa 1893.1 Grace W. Gray died in 1942. Curtis Case was born on 26 April 1806 at Barkhamsted, Litchfield Co., CT. He was the son of Zeben Case and Sarah Merritt. Curtis Case married Azubah Case, daughter of Francis Case and Jemima Case, on 6 October 1833 at Granby, Hartford Co., CT. Curtis Case died on 10 August 1863 at Barkhamsted, Litchfield Co., CT, at age 57. [S101] Ruth Cost Duncan, John Case, Page 117/Item 304. [S418] Ruth Cost Duncan, John Case 2nd Edition, page 115, item 304. Azubah Case was born on 10 May 1810 at West Granby, Granby, Hartford Co., CT. She was the daughter of Francis Case and Jemima Case. Azubah Case married Curtis Case, son of Zeben Case and Sarah Merritt, on 6 October 1833 at Granby, Hartford Co., CT.
Eldridge Case was born on 16 July 1840 at Barkhamsted, Litchfield Co., CT. He was the son of Curtis Case and Azubah Case. Eldridge Case married Lois Ann Rice, daughter of Levi Rice and Mary A. Hack, on 11 September 1860 at Granby, Hartford Co., CT.
[S101] Ruth Cost Duncan, John Case, Page 156/Item 453. Lois Ann Rice was born on 29 March 1845 at Granby, Hartford Co., CT. She was the daughter of Levi Rice and Mary A. Hack. Lois Ann Rice married Eldridge Case, son of Curtis Case and Azubah Case, on 11 September 1860 at Granby, Hartford Co., CT.
Courant Dr. Case was a dentist in Winsted for more than sixty years. He had moved to Winsted at an early age and attended the old Fourth School and West Winsted High School. He was graduated from the University of Pennsylvania in 1897 and opened a practice in Winsted. Active in Masonic affairs, Dr. Case was a past master of St. Andrew's Lodge, AF&AM; a member of Meridian Chapter, RAM, and tyrian Council, R&SM; and a past patron of Magnolia Chapter, OES. for more than 35 years he was treasurer of Clifton Lodge, IOOF, and was a former member of Lafayette Consistory and Sphinx Temple. He was a charter member of the Winsted Club and a member of the Church of Christ. The obituary indicated that he was survived by his wife, Doris Parmelee, apparently his second wife; by two sons, George and Curt, possibly Doris' children; and by two daughters, apparently Dorothy and Catharine, his children by Sarah. Dr. George Curtis Case was born on 11 June 1876 at Barkhamsted, Litchfield Co., CT. He was the son of Eldridge Case and Lois Ann Rice. Dr. George Curtis Case married Sarah Amanda Granger, daughter of Lafayette Granger and Hannah Catharine Swenson, on 4 October 1898 at Winsted, Litchfield Co., CT. Dr. George Curtis Case died Sunday, October 19, 1958 at at his home, Winsted, Litchfield Co., CT.
[S101] Ruth Cost Duncan, John Case, Page 180/Item 558. Sarah Amanda Granger was born on 14 February 1876 at Winchester, Litchfield Co., CT. She was the daughter of Lafayette Granger and Hannah Catharine Swenson. Sarah Amanda Granger married Dr. George Curtis Case, son of Eldridge Case and Lois Ann Rice, on 4 October 1898 at Winsted, Litchfield Co., CT.
[S622] James N. Granger, Launcelot Granger, page 348. [S622] James N. Granger, Launcelot Granger, page 208. Dorothy Lois Case was born on 2 August 1899. She was the daughter of Dr. George Curtis Case and Sarah Amanda Granger. Catharine Elizabeth Case was born on 11 March 1912. She was the daughter of Dr. George Curtis Case and Sarah Amanda Granger. Frederick W. Watrous was born in January 1842 at Chester, Middlesex Co., CT. He was the son of Albert W. Watrous and Catherine S. Herron. Francis Delbert Watrous was born in February 1842 at Chester, Middlesex Co., CT. He was the son of Albert W. Watrous and Catherine S. Herron. Francis Delbert Watrous died on 1 September 1925 at Haddam, CT, at age 83. George R. Watrous was born in 1844 at Chester, Middlesex Co., CT. He was the son of Albert W. Watrous and Catherine S. Herron. George R. Watrous died on 1 October 1864 at Chester, Middlesex Co., CT.
Mary E. Watrous was born in 1845 at Chester, Middlesex Co., CT. She was the daughter of Albert W. Watrous and Catherine S. Herron. Mary E. Watrous died on 22 October 1929 at Deep River, CT.
Catherine Josephine Watrous was born in 1847 at Chester, Middlesex Co., CT. She was the daughter of Albert W. Watrous and Catherine S. Herron. Matilda Jane Watrous was born on 6 June 1849 at Chester, Middlesex Co., CT. She was the daughter of Albert W. Watrous and Catherine S. Herron. Eliza A. Watrous was born on 5 October 1857 at Chester, Middlesex Co., CT. She was the daughter of Albert W. Watrous and Catherine S. Herron. Mary Ann Fish was the daughter of Jonathan Fish. Mary Ann Fish married Fredus Griswold Watrous, son of Elijah Southworth Watrous and Clarissa Holcombe, on 19 September 1838 at Windsor, Hartford Co., CT.
Thomas T. Watrous was the son of Fredus Griswold Watrous and Mary Ann Fish. Curtis Watrous was the son of Fredus Griswold Watrous and Mary Ann Fish. Charles Watrous was the son of Fredus Griswold Watrous and Mary Ann Fish. Albert F. Watrous was born in 1839 at Chester, Middlesex Co., CT. He was the son of Fredus Griswold Watrous and Mary Ann Fish. Information on Elijah and Floretta and their descendants was found on the Family Tree Maker Web site. This information was prepared by Leland Rice Watrous, 1821 Brockway Street, Saginaw, MI 48602. Elijah F. Watrous was born in March 1842 at Windsor, Hartford Co., CT. He was the son of Fredus Griswold Watrous and Mary Ann Fish. Clarissa N. Watrous was born in 1844 at Windsor, Hartford Co., CT. She was the daughter of Fredus Griswold Watrous and Mary Ann Fish. James Dewey Watrous was born on 5 February 1852 at Windsor, Hartford Co., CT. He was the son of Fredus Griswold Watrous and Mary Ann Fish. James Dewey Watrous married Marie Perry, daughter of John Perry and Pauline Alex, on 8 May 1874 at Springfield, Hampden Co., MA. James Dewey Watrous died on 3 July 1940 at Manchester, Hartford Co., CT, at age 88. Information on James and Rosalie and their descendants was found on the Family Tree Maker Web site. This information was prepared by Leland Rice Watrous, 1821 Brockway Street, Saginaw, MI 48602. Waldo Watrous was born in 1855 at Windsor, Hartford Co., CT. He was the son of Fredus Griswold Watrous and Mary Ann Fish. Waldo Watrous died on 30 January 1871 at Windsor, Hartford Co., CT.
Allyn E. Watrous was born in 1864. He was the son of Fredus Griswold Watrous and Mary Ann Fish. Allyn E. Watrous died in 1933 at Great Barrington, Berkshire Co., MA. Caroline Ann Brownell was the daughter of Joseph Brownell and Caroline Butler. Caroline Ann Brownell married Henry Holder Watrous, son of Elijah Southworth Watrous and Clarissa Holcombe, on 21 February 1845 at Naples, Ontario Co., NY. Mary Florence Watrous was born on 26 February 1853 at Naples, Ontario Co., NY. She was the daughter of Henry Holder Watrous and Caroline Ann Brownell. George Holder Watrous was born on 3 January 1862 at Naples, Ontario Co., NY. He was the son of Henry Holder Watrous and Caroline Ann Brownell. George Holder Watrous married Cora Rose Buck, daughter of E. W. Buck, on 26 August 1885 at Naples, Ontario Co., NY. Lucy Grodarent was the daughter of John Grodarent and Rebecca Shultes. Lucy Grodarent married William P. Watrous, son of Elijah Southworth Watrous and Clarissa Holcombe, in 1847.